Take a close look at these two pictures.... Do you notice the difference? If you said "Hey the batteries moved", you're dead on. 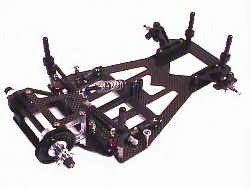 You are looking at the first 4-cell 12th scale chassis with adjustable battery position. Just another innovation from the company that has pushed the 12th scale envelope since its inception in 1994. 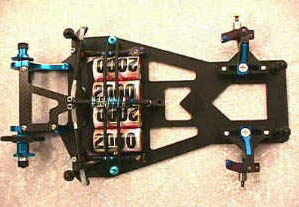 1st with 4-cells in the center line of the chassis, where they belong. (There's not a real road-course racing car in the world that doesn't have the weight as close to the centerline of the chassis as mechanical and aerodynamic design will allow). 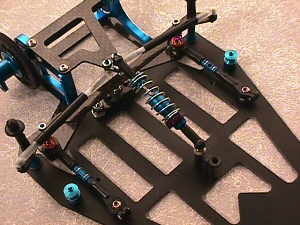 1st with a choice of several real metal coil tweak springs for controlling the side to side movement and tweak. (When's the last time you saw Shumacher ask his mechanics to change the big hunk of fiberglass holding the rear suspension of his Ferrari on? He uses real metal springs, so should you). 1st with tweak adjustments out towards the sides of the chassis for correct leverage and tuneability. (In NASCAR when an ill handling car comes in for a weight (tweak) adjustment, where do the mechanics go? Bingo! To the corners of the chassis. They don't ask Dale to move his legs because he's covering up the adjustment screws). 1st with twin damper tubes for even side to side dampening. (Pretty much immediately copied by several other manufacturers. Don't worry they say imitation is the sincerest form of flattery). 1st with a easily adjustable roll-center. (Just a few shims under your rear suspension balls in either direction and it's done. At the same time you can induce four wheel steering just by raising the front balls. How cool is that?). And now...1st with an adjustable battery position tray. By simply removing two screws you can move your batteries forward and back a full 1/4-inch. Now you might be thinking 1/4 inch isn't that much, well trust us. After extensive testing we found a 1/4 inch change in battery placement is HUGE. Is your home track low traction due to dirt or just plain crappy carpet? Well put the batteries in the "back" position in your Rev.3, soften up your shock, side dampening, and tweak springs and you have a 12th scale car that will hook up on ice. At a big race... traction just getting insane? Your car is "edgy" with an "on-power push" that just won't quit. Put your batteries in the "forward" position and watch your Rev.3 carry so much corner speed it's scary. Your car will be easier to drive, be faster in the corners, and actually get better overall speed and run-time due to "freeing up the chassis". Kind of the best of both worlds huh? That's exactly what we set out to do. If you already own a Rev.2, your in luck. 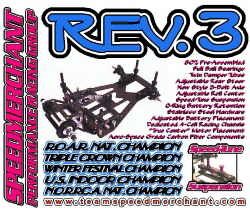 The Rev.3's chassis will mount right up to your existing parts and you've got yourself a new car. 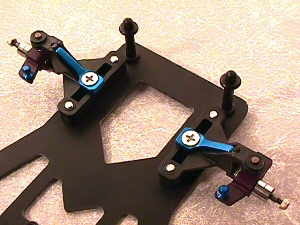 The Rev.3 battery tray allows for a full 1/4 inch of movement. By removing two screws, rotating the tray 180 degrees and re-attaching it. You have completely changed the "feel" of your car. A process that takes about a minute. 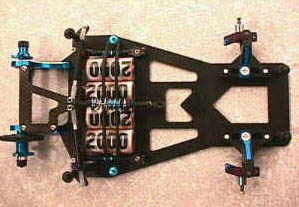 The Rev.3 battery tray with hardware away from the chassis. 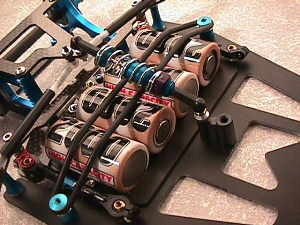 This is a close-up of the new Rev.3 in the "battery back" set up. Note how well the batteries sit in the tray. The battery tray will accept 2000 or 3000mah batteries equally as well. While at the same time strengthening the chassis and acting as a battery brace in head on collisions. 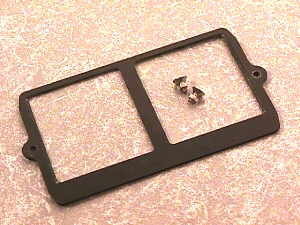 This is the Rev.3 sans battery tray. The new battery slots no longer require any filing. All you have to do is gently remove the edges off of the tray and once installed the batteries will sit flush with the bottom of the chassis. This is also a great shot of the �Speed-tune� Suspension found on the entire line of SpeedMerchant cars. This is a close-up of our new battery posts. 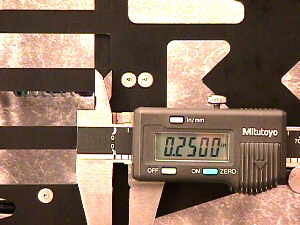 We acctually milled the exact diameter of our battery retention o-rings into the sides of the new posts. Needless to say you will have no problem with o-rings coming off. Here are the new dress kits for 1999. We've added the cool silver highlights to match the rest of our parts, and the new turnbuckles are larger and stronger with a finer thread for more precise adjustments. This is a close up of the "old skool" front end used by many of our team drivers. Just a note about this. Here at SpeedMerchant, we do a lot of testing, and I can tell you on our car the old style front end works better about 90% of the time. Here's what we've found over the past few seasons. The new stlye front end is better on bumpy tracks. Hopefully yours' isn't like that, but in our travels we've been on some pretty scary surfaces. In these cases, we put the new style front ends on the cars. The "old skool" (yes, I realize that's not how school is spelled) front end gives our car more steering entering a corner than the new style front end. In the center and exit of the turn it has slightly less steering than the new style front end. This tends to compliment our chassis' handeling characterisitcs. Because of having all the weight in the centerline of the chassis, the Rev.3 doesn't transfer as much weight as most 12th scale cars do when entering a sharp corner, this can lead to "push" or "understeer". Like I said earlier the old style front end remedies this situtaion. Once you're in the corner the Rev.3 makes it VERY easy change your line(passing), and to drive tight and fast. Why? 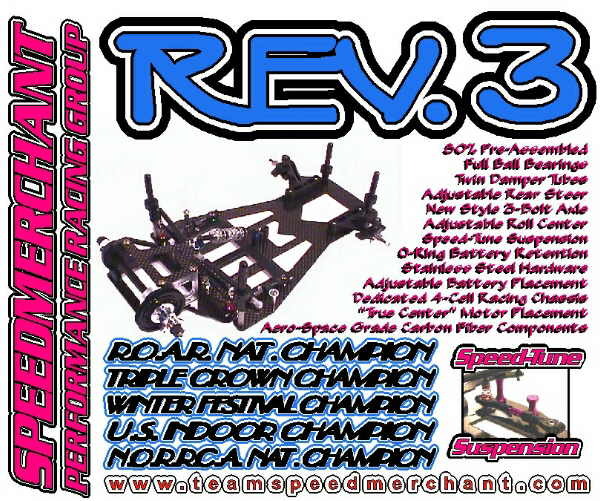 Because The Rev.3 didn't transfer all that weight when it initially went into the corner, it now doesn't have to wait for the transfered weight to rebound and then settle back down. The Rev.3 stays flat through the entire corner. Remember, when ever you have any motion other than forward, ie. side to side swaying, you are loosing foward momentum. That's a fact. So a flat chassis equals extra speed and efficiency that wasn't robbed in the corners. The "old skool" front end has much less "slop" than the new style. 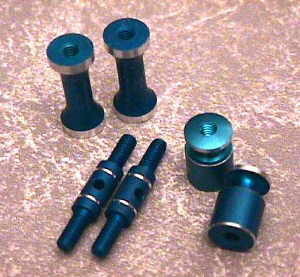 Whenever you have "play" in a suspension, either from wear or poor assembly you are just asking for inconsistency. The "old skool" front end weighs about 1/2 of what a new one weighs. 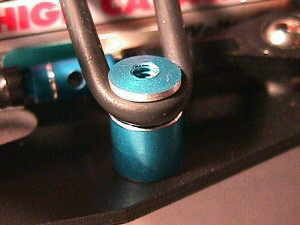 This lowers your cars total weight as well as lowering its' center of gravity. The "old skool" front end can take a good hit and not go out of tweak. The new style front end is notorious for "moving" after a hard hit and then throwing the whole car out of tweak. Tons-o-times over the past few years drivers have brought me cars to look at with the complaint "It's out of tweak." After going through the car, guess where the problem is usually found. The front end. Either the delrin pivot balls are bound up, a spring is collapsed, or just too much play in the parts, etc, etc, etc. Remember the K.I.S.S. theory on racing. Keep It Simple Stupid.